Presentiamo qui un documentario sulla “generazione perduta”, quella dei bambini siriani che sopravvivono al conflitto. Alcuni di loro si raccontano in questo lavoro audiovisivo di Hugh Mcleod e Annasofie Flamand pubblicato su Journeymantv. Di seguito la presentazione in inglese dei due autori di Playground from Hell. Over 3,000 children have died in Syria’s conflict. For the survivors innocence is lost and play is a charade from another life. Through their stories we glimpse into a world no child should have to suffer. 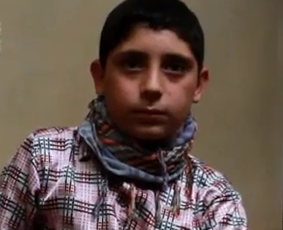 Ahmad has grown wise to the rules of Syria’s deadly grown-up games. He calmly recollects how his home was recently searched by the army. “The man said, ‘repeat after me: the people want…’. I said: Bashar al-Assad, of course.” Age has offered no escape in Syria’s bloody battle of attrition. Schools have become military bases, families have been driven from their homes and children have seen parents, siblings and friends murdered. In Homs, a city almost entirely destroyed, three children take to the stage, singing a chant of martyrdom whilst men below sway to the rhythm. At home with a farming family as the sound of shelling grows closer, it is clear why eleven-year-old Yahya “cries out in fear” in his sleep. 5-year-old Malek says she isn’t scared of the shelling, but since her father was killed she hides behind her mother whenever she hears the sound. Brothers from Homs break down in tears as they describe fleeing the bombardment of their home and the men with knives who butcher children. “Where is the world?” implores one of the children, his face scraped, his eyes filled with tears. Dar Onboz, "I sogni non possono aspettare!"